Ganga Aarti at Haridwar and Triveni Ghat are good opportunities to explore the local culture. You'll find plenty of places to visit near Rishikesh: Shri Badrinath Ji Temple (in Badrinath), Haridwar (Mansa Devi Temple & Har ki Pauri) and Kunjapuri Temple (in Narendranagar). Next up on the itinerary: let the river carry you with a rafting and tubing tour, take in the views from Ram Jhula, take in the spiritual surroundings of Kunjapuri Devi Temple, and steep yourself in history at The Beatles Ashram. To find maps, photos, reviews, and more tourist information, you can read our Rishikesh day trip app . Mumbai to Rishikesh is an approximately 4.5-hour combination of flight and taxi. You can also drive; or take a train. Wrap up your sightseeing by early afternoon on the 28th (Fri) to allow enough time to drive to Nainital. 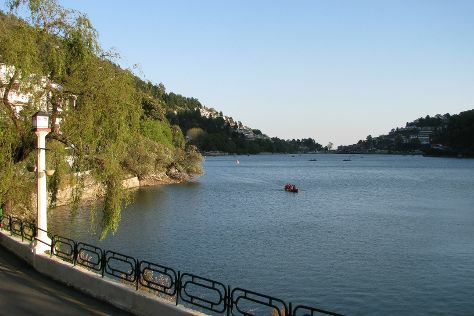 Start off your visit on the 29th (Sat): take in the spiritual surroundings of Goddess Naina Devi, then explore the activities along Sattal, then admire nature's wide array of creatures at Bhimtal Island Aquarium, and finally contemplate the waterfront views at Bhimtal Lake. Here are some ideas for day two: admire nature's wide array of creatures at High Altitude Zoo, then take in nature's colorful creations at Eco Cave Gardens, and then take in the dramatic natural features at Tiffin Top (Dorothy's Seat). To find maps, where to stay, photos, and tourist information, read our Nainital tour itinerary maker app . Traveling by car from Rishikesh to Nainital takes 5 hours. Alternatively, you can do a combination of bus, train, and taxi; or take a bus. Wrap up your sightseeing by early afternoon on the 31st (Mon) to allow enough time to drive to Mussoorie. Kick off your visit on the 1st (Tue): get engrossed in the history at SOHAM Heritage & Art Centre, then tour the pleasant surroundings at Company Garden, and then admire the sheer force of Kempty Falls. Keep things going the next day: tour the pleasant surroundings at Gun Hill, then hike along Camel's Back Road, and then don't miss a visit to Lal Tibba. For ratings, other places to visit, photos, and more tourist information, read our Mussoorie road trip planning app . You can drive from Nainital to Mussoorie in 6 hours. Other options are to do a combination of taxi and train; or do a combination of bus and taxi. Finish your sightseeing early on the 2nd (Wed) so you can travel back home.